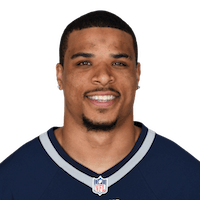 The Patriots waived Lucien on Saturday, Doug Kyed of NESN.com reports. Analysis: Lucien hasn't dressed for an NFL game since being drafted by New England in the seventh round of the 2016 NFL Draft. He'll likely land on the team's practice squad. Lucien signed a contract with the Patriots on Monday, Tom Pelissero of NFL.com reports. Analysis: The former Arizona State standout has bounced around various teams' practice squads over his first three seasons. He now returns to the team that drafted him in the seventh round of the 2016 NFL Draft, where he'll look to compete as a depth wideout and special teams contributor. Lucien was waived by the Buccaneers on Sunday, Jenna Laine of ESPN.com reports. Analysis: Lucien has spent his first two seasons bouncing around on practice squads but never touching the game field. The 24-year-old wideout snagged 66 passes for 1,074 yards and eight touchdowns in his senior year (2015) at Arizona State. Lucien will need to establish value on special teams to stick around on a 53-man roster. Lucien signed a reserve/future contract with the Buccaneers on Monday, Greg Auman of the Tampa Bay Times reports. Analysis: Lucien spent time on three different practice squads in 2017, but finished the season with Tampa Bay and will enter the team's offseason program. The 2016 seventh-round pick has yet to make his NFL debut. The Buccaneers signed Lucien to their practice squad Wednesday, Scott Smith of the Buccaneers' official site reports. Analysis: Lucien has already been a member of three different practice squads this season, with the wideout spending time in the Indianapolis, Kansas City and Houston organizations. Though he may not receive a promotion to the Buccaneers' 53-man roster before the end of the season, Lucien will look to impress in practices in order to earn a longer look during training camp next summer. Lucien was released from the Texans' practice squad, Aaron Wilson of the Houston Chronicle reports. Analysis: Lucien, who was signed to the practice squad when the Texans were hit with a couple of injuries at wideout in Week 13, was with the organization for about a week. His release suggests Braxton Miller (concussion) is nearing a return. Lucien was signed to the Texans' practice squad. Analysis: Houston finds itself thin at wideout, so adding Lucien to the pipeline makes sense. If health at the position remains an issue, the second-year undrafted free agent out of Arizona State may eventually reach the parent club. There are no videos available for Devin Lucien. Click here to view all videos.